My favorite thing about Arby's used to the the Curly fries. Have you had the opportunity to try out Arby's New Smokehouse Brisket Sandwich? It reminds me of of my childhood days in North Carolina. Get the scoop on this new sandwich available at Arby's! I lived in Western North Carolina a place where electricity would go out with winter storms and flooding that happened pretty regularly, which made smoking a great alternitive to counting on electricity and frigeration. Prior to the widespread availability of electricity and freezers, meat was preserved by heavy salting. Then they smoked them in a smokehouse for days at a time. Smoking is a process that cooks the meat, adds flavoring and preserves the food by exposing it to smoke of either burning wood or plants. The meat turns out super yummy. We also loved making Beef Jerky to eat in the tree stands for winter hunting. Arby's new Smokehouse Brisket reminds me of those days from my childhood. You can't rush real, smoky tenderness and taste. 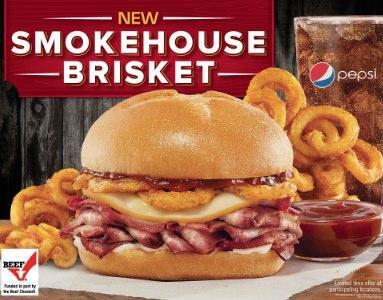 Arby's know that and it's new Smokehouse Brisket sandwich is smoked for at least 13 hours. Even though it's smoked low and slow, it’s ready when you visit, without having to wait days before you can eat it. Arby’s New Smokehouse Brisket Sandwich is piled high with slow-smoked beef brisket. It has smoked Gouda cheese, crispy onions and served with BBQ sauce and mayo on a toasted, bakery-style bun. Try it out at your local Arby's or through drive thru for a hearty meal on the go! They serve everything from market fresh sandwiches, Angus Philly Cheese steaks, chicken and roast beef sandwiches. Find an Arby’s new you to try the New Smokehouse Brisket sandwich. What makes you excited to try the new Smokehouse Brisket sandwich? For me it would be the Gouda cheese. Let me know what you think in the comments below what your favorite part or parts of the sandwich would be. Do you have any memories of smokehouses when you were young?